Getting Google Optimize installed on your website isn’t the most straightforward process. While the tool itself allows users with even minimal technical experience to begin testing simple changes on their website in a matter of minutes, installation may require an upfront effort with close collaboration with your development or IT team. Recently I wrote a guide to getting started with Google Optimize. In it, I briefly covered the implementation of Googles new A/B testing tool. It hasn’t been long since we published that blog post, but already the best practices for implementing Google Optimize have changed. Consider this your updated guide for implementation. We’ll cover how to add the Google Optimize snippet and how to make sure it plays nice with Google Analytics and Google Tag Manager. Let’s get started. Google Analytics Account. You likely already have one of these. If not, you can get one here. You’ll need a Google Account to sign up, which can be a Gmail account or a company email address associated with Google. Specifically, Optimize requires Universal Analytics to operate. Google Tag Manager (recommended). We strongly recommend using Google Tag Manager. Tag Manager will allow you to easily add Universal Analytics and Optimize to all pages of your website. It will also allow you to track events (i.e. link clicks, form submissions, etc.). 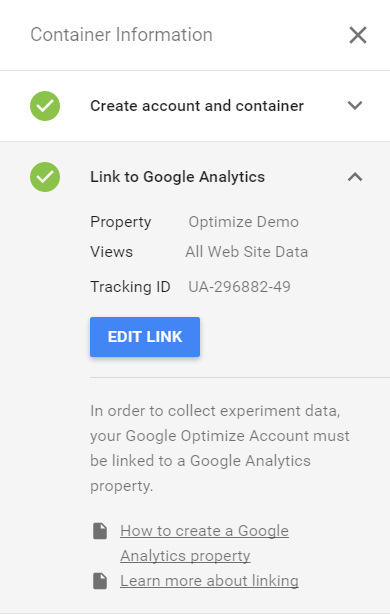 Optimize requires that you use GA goals as experiment objectives, so you can use GTM to track events, and GA to count those as Goal Completions. In the past Tag Manager was implemented immediately following the opening body tag. With the release of Optimize, Google has updated the Tag Manager container so that it can be placed immediately following the opening head element. We have instructions for installing Tag Manager here. Google Chrome Browser. Optimize requires a chrome extension to modify test variations. That extension can only run on a Chrome Browser. Download Google Chrome here. Google Optimize Chrome Extension. The Optimize chrome extension is what powers the Optimize visual editor. It is required for you to be able to modify variants of a page. Download the Optimize Chrome Extension here. Once you have access to Optimize, you’ll be able to login and create an experiment. An account allows you to run experiments on one or more websites, you’ll likely only need one account per company. The container is where all your experiments and configuration settings will live. Click “Create Account” and you’ll be prompted to enter an account name and container name. After you accept the Optimize Terms of Service your account will be created and you’ll be sent to the container pages. Linking a container to Google Analytics allows data to flow between the two products. On the right-hand side of the container page you will see a 5-step process for completing the setup. Expand the “Link to Google Analytics” dropdown. Then click the “Link Property” button. Select the property you want from the dropdown, making sure that the property you select corresponds to the domain on which you’ll be running experiments. Then select one or more views that you would like to connect to Optimize. Click the blue “Link” button and Google Optimize will be linked to your property and views. View Selection is Important. The maximum number of goals a Google Analytics account can have is 20. And because Google Optimize requires events like link clicks or form submissions to be recorded as a goal in Google Analytics before it’s used as an experiment objective, you’ll need to think about how many goals you’re currently using and what additional goals you’ll need to set up for testing. If you are close to the maximum number of goals allowed by GA, then you may want to set up a testing view that can accommodate additional goals. There are other things to consider with your View selection. This View is where you’ll see all of the results from your experiment inside of Google Analytics. Filters on your View will also affect your experiment results data. If you’re filtering out internal traffic from a View, for instance, they may still see the experiment, but their data will not be included in the results. 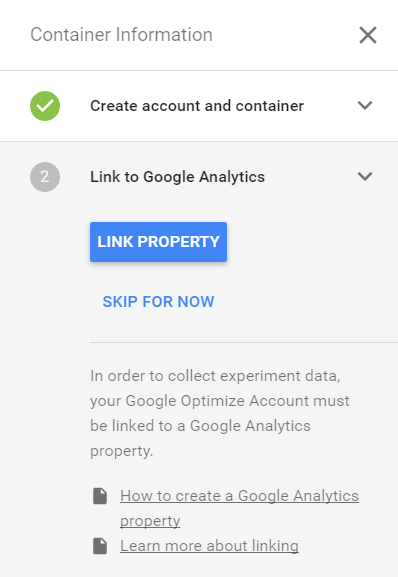 Now that you’ve created an Optimize account and container, and have linked your container to GA, you’ll need to install the Google Optimize snippet on your website. I’ll stop here to say that there are lots of different options, depending upon your previous implementations of Google Analytics and Google Tag Manager. These options range from the easy (add a Tag in Google Tag Manager) to the complicated (add extra code to your page.) There are pros and cons to each method, which is enough material for a completely separate blog post. As Google Optimize is still in beta, these instructions may change at any time. We believe that the Google products all work really well together, and we like using them all. 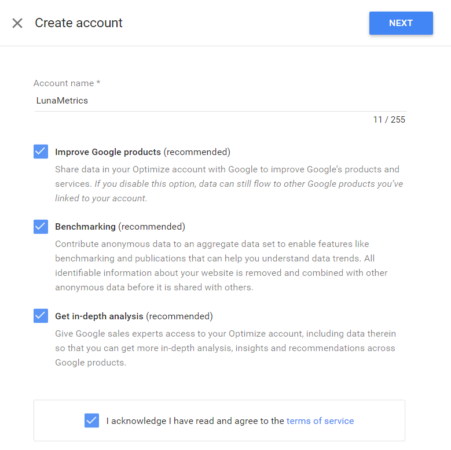 Our recommended approach comes straight from the Google support documentation, and is the best way to both ensure that your experiments load as quickly as possible while still maintaining the flexibility that Google Tag Manager offers. Other trackers, Analytics tags, ad tags and/or a tag-management snippet. Other scripts that you won’t target Optimize experiments against. For the page hiding snippet to do its job, it needs to be placed as high up in the head as possible – after <meta charset> and before the Optimize, Analytics, and/or Tag Manager snippets. Page Hiding Snippet Timeout Function. The page hiding snippet has a timeout function that stops Optimize from trying to load an experiment if too much time has passed. The default time is 4 seconds, which is represented as 4000 milliseconds in the snippet. This time can be changed, just know that changing the timeout might affect how many people are included in your experiment. Let’s talk about that Analytics-Optimize Snippet and what is included and what is not included. Again, make sure you read the right support documentation. Here’s our desired order of operations. GA – Pageview Tag is fired from Google Analytics. ga(‘create’, ‘UA-123456-1’, ‘auto’); – This translates to: “Let’s load the Google Analytics tracker. When we’re ready, we’re going to send our data to this specific property, UA-123456-1, but nothing yet. Also, we’re setting our cookieDomain to auto, which means we’re making sure this works on subdomains. That’s it. Notice that at no point did we send information to Google Analytics. We’re going to continue using our Google Tag Manager to handle that. We’ve been recommending Google Tag Manager for years, so if you haven’t upgraded yet, now’s a great time! The installation instructions changed for Google Tag Manager recently, which split the code into separate parts, one in the head and one in the body. Whether you have Google Tag Manager installed the old way or the new way won’t really matter here, but if you’re making changes to the on-page code, then why not fix everything. IN GTM: No GA pageview tag in Google Tag Manager. IN GTM: Yes GA pageview tag in Google Tag Manager. Installing Google Optimize can get complicated. Following our instructions closely will get you there, but also be careful and check your Google Analytics and Google Tag Manager to make sure there are no major changes to how things fire, or changes to metrics like Pageviews or Bounce Rate inside of Google Analytics.